This view shows a conceptual design for a new Campus Life Center as seen from McDonough Field. View image larger. Another view of a possible design for the Campus Life Center. You can see the roof of the McDonough Field stage on the left. Pictured are two views of a conceptual design for a new Campus Life Center. Created by Duda/Paine Architects, the drawings are initial visions of what the project might look like, not the final design. What is the projected cost of a new CLC? — Early estimates place construction costs around $59 million, with final project costs estimated at about $85 million. As someone who calls the DUC home — and for those who have offices in the building — where will we be? Those questions will be addressed throughout the Fall 2015 semester as the project continues in its programming phase. Will anything from the West DUC be left? Current design concepts call for the removal of the Portman Building. Where will students go during construction? Plans are underway to identify spaces to relocate temporary food service — and other affected services — during the estimated two-year construction cycle. Why not just renovate the West DUC? Noise levels within the tiers are not conducive to community building, meetings or informal gatherings in the Coca-Cola Commons. Costs of renovation were only slightly less than rebuilding. How much new space is gained in this design concept? 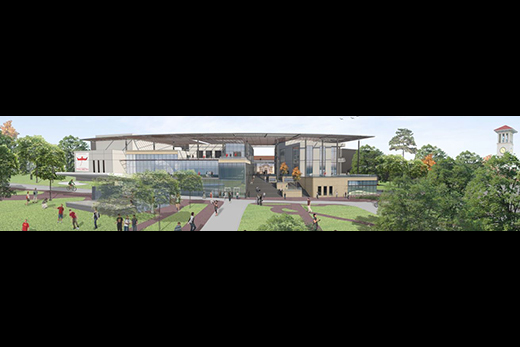 The preliminary design represents 132,000 gross-square-feet, a gain of about 61,000 gross-square-feet for Campus Life programming. Will plans to separate and uncover the historic East DUC create challenges? There is historic and aesthetic value to the AMUC. Re-exposing the marble façade will be done with care. 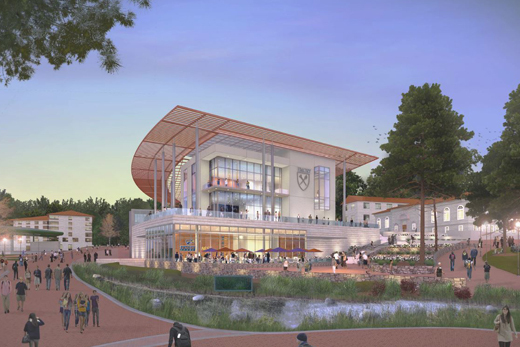 In 2013, Emory's Division of Campus Life launched an eight-month feasibility study focused on renovating and expanding the Dobbs University Center (DUC), which proposed the largest changes to the structure since 1986. Recommendations called for preserving the original Alumni Memorial University Center (AMUC) or "East DUC," but noted that the "West DUC" — the 1982 Portman Building addition — "functions poorly and is considered visually unfriendly and aesthetically antithetical to the elegance of Emory University's campus architectural character." The need for change was driven not only by growing space demands, but a desire for larger, more flexible and efficient dining services, technology and infrastructure upgrades, and more room for student organizations and gathering spaces, the study noted. While developing early concepts for a new CLC, Duda/Paine representatives returned repeatedly to the Emory campus to talk with community members, observe how the current DUC is used, and explore spaces on campus "between buildings" — such as greenways that contribute to the campus aesthetic. In addition to understanding how the DUC now works, the team also heard about "how well the Dobbs Center does not work," Duda added. "So many buildings of that era have stopped working as centers to draw students." Identity, that element that says, "Wow, this is Emory." From those themes, the firm developed five conceptual schemes, out of which a modern, open piazza-inspired design was favored "almost unanimously," Duda said. Preliminary designs propose removing the West DUC addition and replacing it with three pavilions connected by a sweeping trellis-like roofline — "almost a canopy" — facing McDonough Field that would "tie the buildings together into a unified whole," Duda explained. Glass walls would not only allow students to see outside, but permit an inviting glimpse of indoor activities, he added, creating a building "that extends itself beyond its own footprint. Preliminary plans call for the existing East DUC — including the AMUC, with its marble façade, and the Harland Cinema — to be preserved as a free-standing structure, he added. An outdoor water feature and multiple levels of outdoor seating. Another public forum will be scheduled on campus with the architecture team once classes are back in session. More information about the project, including a timeline, is available at duc.emory.edu/clc.